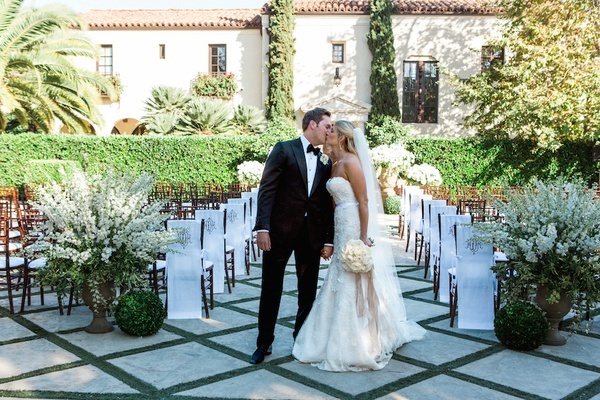 When it came to selecting the locale for their wedding, Whitney Hoek and Kenny De Angelis knew exactly where they wanted to get married – Santa Barbara. After all, this was the first destination they visited as a couple. “It was my first time in Santa Barbara and we both fell in love with [the area] and each other on that trip,” Whitney reveals. 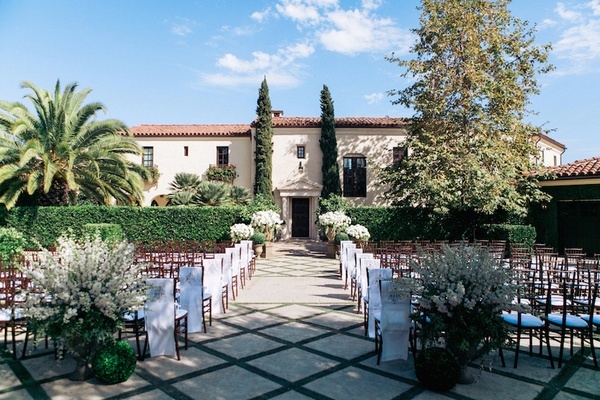 Being fans of architecture and interior design – as can be seen in Whitney’s blog, Between the Boxwoods – the pair was delighted to secure a luxurious villa influenced by Mediterranean architecture, fitting to “The American Riviera” – as Santa Barbara is known – for the celebration. 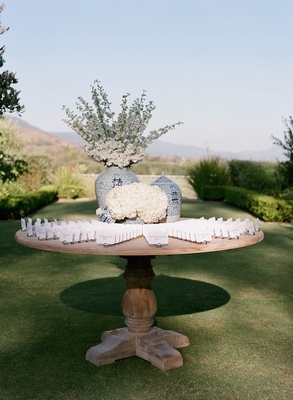 Wooden chiavari chairs, with the first of each row swathed with a vanilla liner bearing the couple’s monogram, were set upon stone pavers edged by green grass. 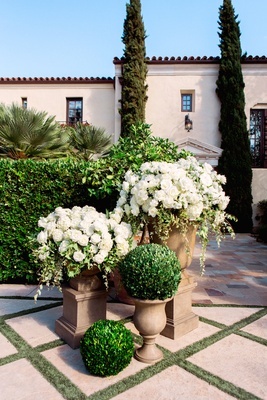 Two large arrangements of creamy flowers and foliage next to boxwood spheres stood at the top of the aisle. 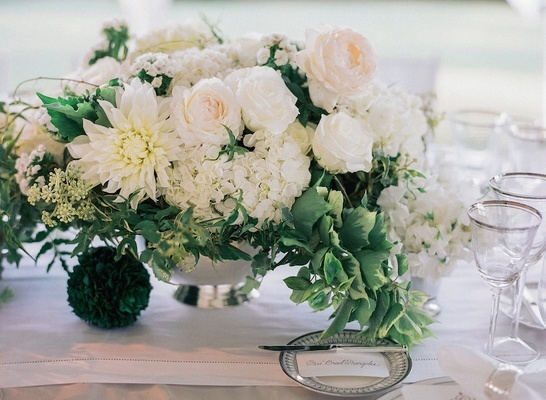 The bride was stunning in a strapless lace gown and loose waves as she made her way to the altar – framed by earth-tone urns filled with lush bouquets of pearl roses, hydrangeas, and verdure or topped with boxwood spheres – and her awaiting groom in a black tuxedo. 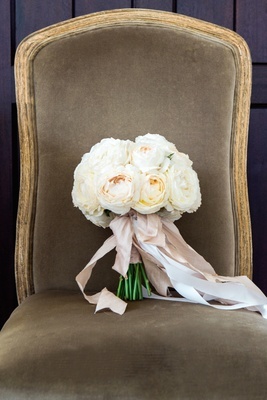 Whitney carried white roses hand-tied in draping champagne silk and ivory satin ribbons. 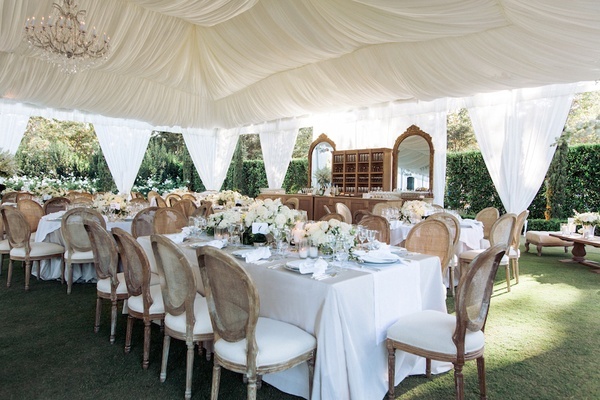 Her “something borrowed” was the veil her friend, actress JoAnna Garcia Swisher, donned at her nuptials. 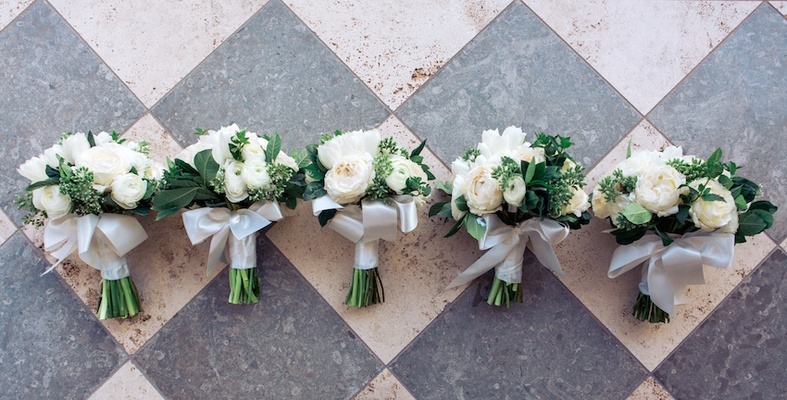 “It was special to be wearing something so meaningful to my friend and we hope to carry on the tradition and have our other friends wear it on their wedding days,” shares Whitney. 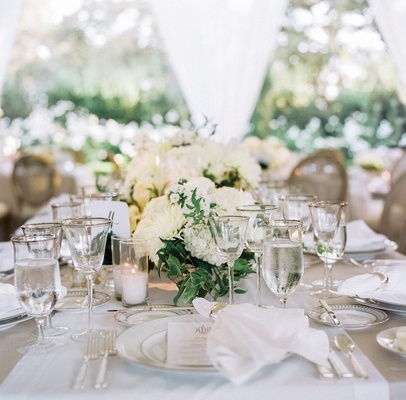 Although the couple selected a string quartet for the ceremony, they did not want to the mood to be too formal and included modern songs in the playlist: “Bittersweet Symphony” by The Verve for the processional and “Paradise” by Coldplay for the recessional. Further reflecting their personalities, “We [incorporated] a few of our favorite quotes [in the service] and it was funny and sweet,” says Whitney. 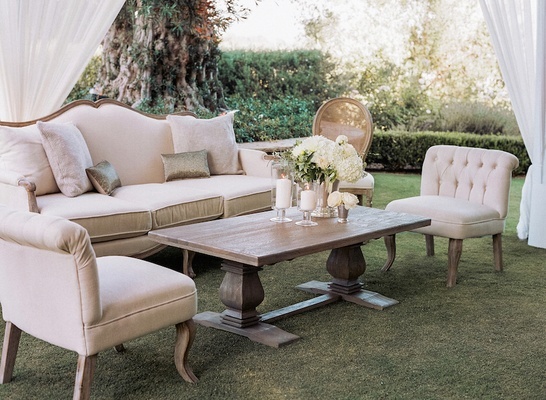 When the vow exchange concluded, guests walked through the house to a bountiful cocktail hour held on the patio with a view of the property’s polo field. 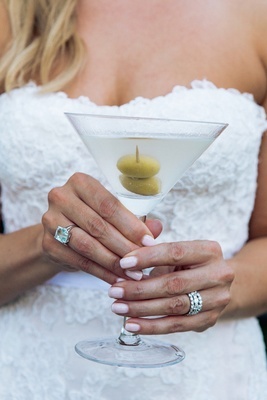 Selections included dirty martinis, vanilla agave margaritas, and wine, as well as passed hors d’oeuvres, a taco-and-tequila pairing station, and a build-your-own slider post. 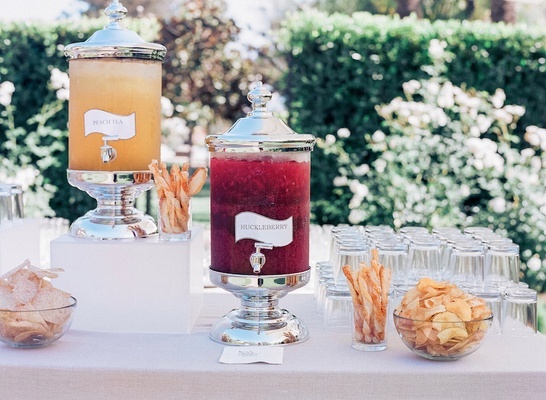 “We love to throw parties, so we wanted everyone to be well fed with plenty of drinks,” explains the bride. 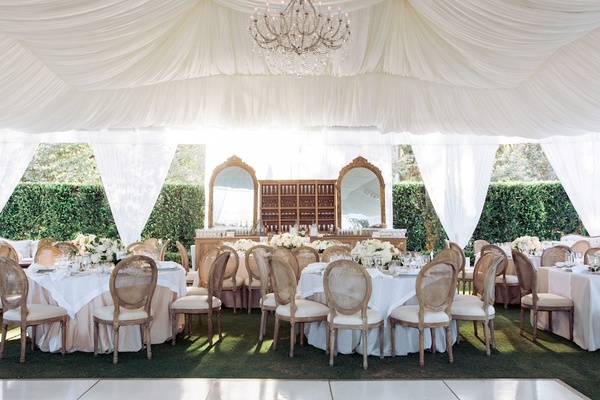 For the reception, loved ones entered a plush billowy tent, with suspended crystal chandeliers, that afforded gorgeous views of the verdant location. 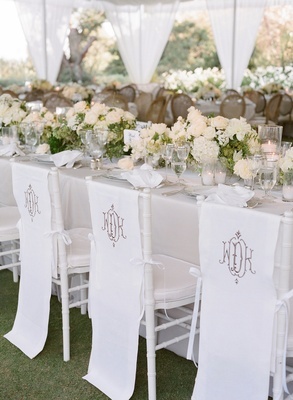 The long head table was draped in taupe linens and surrounded by chairs with monogrammed sleeves. 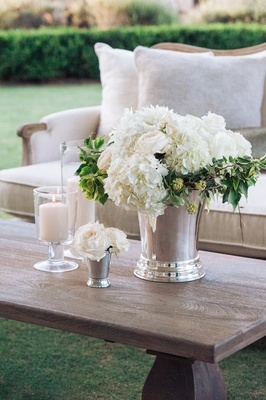 Revere bowls brimming with white hydrangeas, roses, dahlias, and foliage were lined along its center and interspersed with candles. 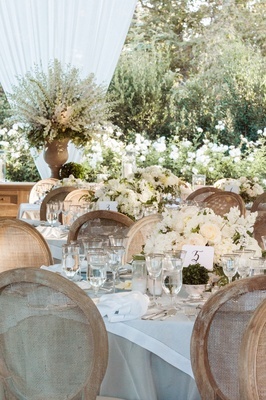 Similar designs decorated guest tables, while cane-back upholstered dining chairs lent a slight rustic touch. 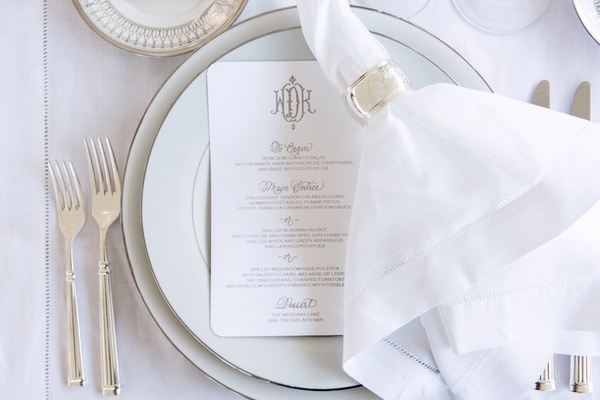 Place settings were composed of sophisticated silver-rimmed china, glassware, and napkin rings. 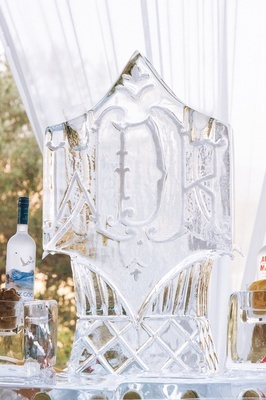 Ensuring no one would go thirsty, libations were available at a custom-made wood bar bookended by two large mirrors, as well as a monogrammed ice martini luge. 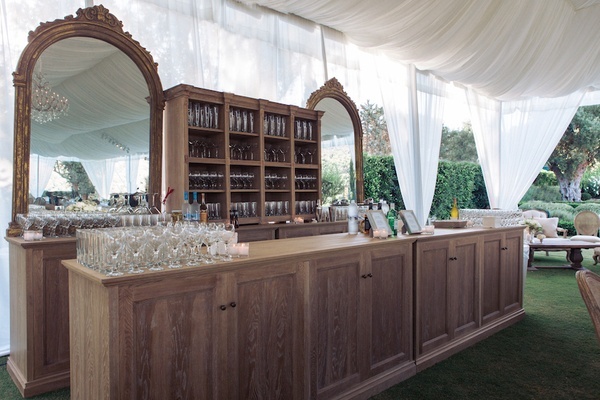 The couple also commissioned four credenzas, which displayed large arrangements of delphiniums, candles, and boxwood spheres, to accompany lounge furniture and give the interior the feel of an estate. 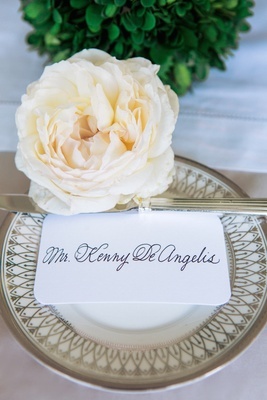 Whitney and Kenny were overjoyed by the way their vision materialized and give full credit to their wedding consultant. A classic five-layer cake was embellished with the couple’s monogram, fresh roses in vibrant hues, and pearl beading around each base. 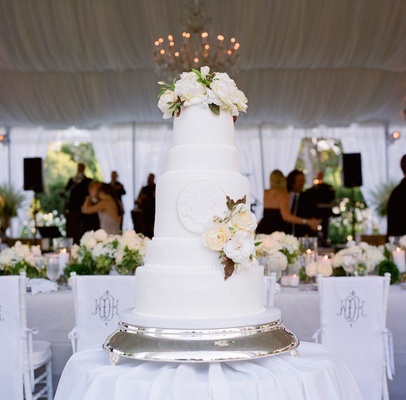 The delicious confection consisted of chocolate cake with mocha mousse and carrot cake with cream cheese filling – Whitney and Kenny’s favorite combinations. After the reception ended, festivities moved to the villa’s wine cellar for an after-party offering cigars, cocktails, and more dancing.